We just received the first ever Hula Boat Care themed Waterloo Surf Craft surf board that we will be giving away at the Austin Boat Show January 7 -10 at the Austin Convention Center. Drop by booth 406 during the show to learn more about Hula Boat Care products and see how you can take this board home. The 2015 West Coast Wakesurf Open is held May 28 – May 31 at Camp Far West Lake in California, USA. 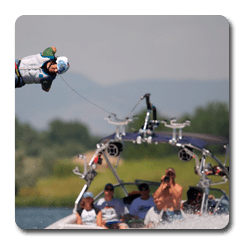 Hula Boat Care Products has a growing reputation for supporting professional watersports, Wakesurfing and athletes that have a dedication to their craft and the water. This dedication to watersport athletes continues with announcement of Hula Boat Care’s sponsorship of the 2015 West Coast Wakesurf Open – part of the 2015 Tige Endless Wave Tour®. Hula Boat Care Products specializes in sharing a passion for marine surface care with like-minded boat owners. Inspired by the relaxed life style of the South Pacific and with 20 years of surface care experience Hula Boat Care have created an eco-friendly line of boat detailing products including: compounds, polishes, cleaners, waxes and vinyl cleaners designed to provide professional results with minimal effort. Hula Boat Care Products is known for its line of eco-friendly and very effective line of boat detailing products. The company also has a growing reputation for supporting professional watersport athletes that have a dedication to their craft and the water. This dedication to watersport athletes continues with announcement that Morgan Lohmeier will join the Hula Boat Care Products Team for the entire 2015 season. Morgan Lohmeier is a 20 year old student attending the University of Texas, Austin. Known by friends as “Molo” Morgan has started to emerge in the professional Wakesurfing scene. Last September was Morgan’s first time at World’s after competing in the outlaw division. Morgan was also named as the people’s choice award for the 2014 Female Breakout Rider. For the 2015 season Morgan will make the jump to compete in the pro division. Hula Boat Care Products specializes in sharing a passion for marine surface care with like-minded boat owners. Inspired by the relaxed life style of the South Pacific and with 17 years of surface care experience Hula Boat Care have created an eco-friendly line of boat compounds, polishes, cleaners, waxes and vinyl cleaners designed to provide professional results with minimal effort. 2009 was the very first year Ashley started wake surfing and just a year later she began competing professionally. In 2010 she participated in the World Wake Surf Championship where she entered in the amateur women group and took 2nd place. Ashley was recognized for her aggressive style. Since her first competition in 2010, Ashley has competed professionally on the wake surfing podium over 25 times, an accomplishment no other professional wake surfing athlete can declare. She has never finished under second place in any professional wake surfing competition, an extraordinary performance for anyone. She could not imagine her life any other way. She loves what she does and has such a huge drive and passion for being on the water and wake surfing. She’s looking forward to what’s ahead and continuing her successful career as a professional wake surfer. You can follow Ashley on facebook or Ashley Kidd’s official website.